Toadie telling Bill that Karl is off at a motel with Sarah. Bill throws Toadie out of the Kennedy's house. Karl and Sarah are having breakfast. Neither have much of an appetite so they pay the bill and leave. Michael has arrived for the wedding – but Debbie couldn't make it, she has a new job. Phil suddenly realises he hasn't got the house ready for the reception, but Hannah says has it all under control with flowers and ribbons. Ben has arrived for the wedding. They all greet him happily. Bill comes in and tells Lance he's had a fight with Toadie for personal reasons. He is trying to back out of playing at the wedding. Lance tells him he can't back out now. They go to the Kennedys to continue their conversation. Madge is cooking beef. The smell of the meat is making Harold feel sick(!) so he goes out to get some air. Lance is mad with Bill – the wedding is more important than a row between him and Toadie. Lance insists to Bill that he has to do the duet with Toadie at the wedding. He finally agrees, as long as Lance asks Toadie if he's still in it. Bill still won't tell Lance what they fought about. Lance stalks off. Michael and Hannah are arranging flowers and ribbons for the reception. 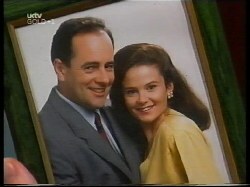 Michael looks at a photo of Hannah and Julie and an old one of Phil and Julie. He thinks it's a bit strange to have photos of Julie still around and maybe they should put some of Ruth up, just for today. Hannah gets cross but eventually sees Michael's point of view. She opens a drawer to put some photos in and finds one of Julie already in there. She is upset. 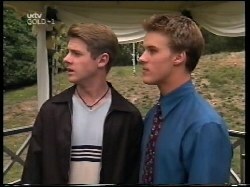 Lance is talking to Toadie, but he won't tell him why he and Bill are fighting. Toadie says if Bill doesn't apologise, he won't sing. 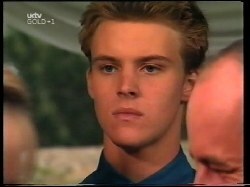 Lance tells him to stop being so selfish – the day is about his mum's wedding, not Bill and Toadie's fight. Hannah is still upset about the photos of Julie. She says she does like Ruth, Lance and Anne very much, but she's worried about them all sharing a house. Michael says he understands – Julie took over from his mum. Hannah says she's scared at the thought of a new family, but Michael says she's got nothing to worry about – Phil will always love her. He suggests Hannah puts Julie's photos up in her room, and they can talk again after the wedding if she wants. Karl's Thunderbird has broken down. Sarah is trying to start the engine. Amy is taking photos of Ruth, Lance, Anne and Ben. Ruth answers the phone to Lou. Ruth wishes that it had been a specialist. Ben asks what's going on. Susan arrives home. Bill is brooding and distracted. Susan realises and asks him what's wrong. Ben tells Ruth that she should have told him straightaway – he is quite upset. He tells her how much she helped him to think positive when he was in hospital and that she should do the same. Ruth says that whatever happens, she's glad they found each other and had time together. Susan is pressing Billy impatiently. She is hurrying to get ready for the wedding. Eventually he gets out the words that he thinks Karl is having an affair with Sarah. Susan is initially incredulous, but then says that Bill had better fill her in. Phil is practising his speech. The celebrant suggests that he cuts half of it out as it's a bit long. Phil is stressed out. Lou comes in to tell him that the car is ready. Lou says he'll help him with the speech in the car. 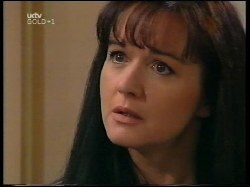 Hannah tells Michael that she is wearing Helen's ring and how happy she'd be for Phil. The kids bring Ruth out of the house to reveal a motorbike outside – it's her dream to ride to the church on it! They put a leather jacket and helmet on her and she rides off. The motorcycle passes with Ruth screaming for joy. Sarah asks Karl to drop her and Bob at the end of the street. Ruth is still travelling to the wedding! The guests are all gathered. Lance and Bill are still waiting for Toadie to turn up. Phil is still stressed out. Ruth arrives on the motorbike and makes her way to the front with Phil. Susan is looking around for Karl. Sarah arrives home. Everyone is at the wedding. Ruth and Phil are taking their vows. Phil suddenly realises he's left the rings at home! Hannah gives him Helen's ring and Lou gives Ruth his for Phil. As they exchange rings, Karl comes up behind Susan and says, “Sorry I'm late”. The celebrant pronounces Phil and Ruth husband and wife. Bill sees Karl and his face becomes like thunder.